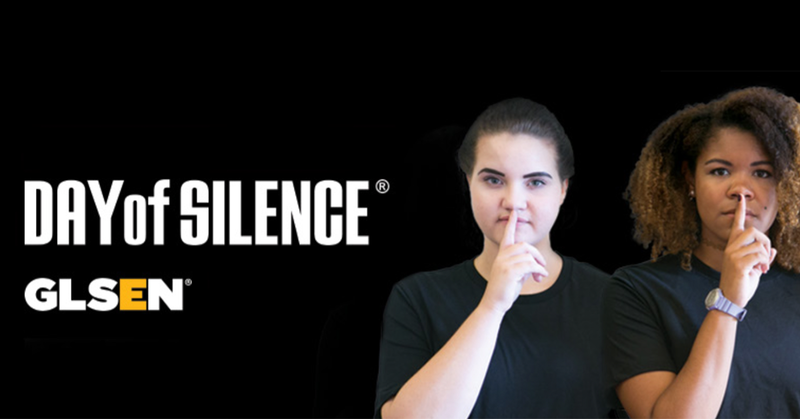 Breaking the Silence is a critical part of GLSEN’s Day of Silence. The Day of Silence is a moment in the year where students replicate silence to highlight the silencing and erasure of LGBTQ people at school. This is a day where students highlight what some students may experience on a daily basis in schools. The effect of using silence as an organizing tool fuels the second part of this day which encourages students, community members, and school leaders to take action in “breaking the silence” and creating a more LGBTQ-affirming school. Breaking the Silence is a chance for participants to make noise, have conversations about the silencing and erasure of LGBTQ identities, and advocate for changes in your school, such as with GLSEN’s Breaking the Silence Letter Generator. It may also be an opportunity for school or community leaders to listen and share how they are going to make changes to create an environment where LGBTQ students don’t feel silenced and erased. Note: Breaking the Silence is created for LGBTQ students to voice what they need to make their schools more safe and affirming. For LGBTQ allies, advocates, and adults, follow the lead and comfort of your LGBTQ students, and support their direction for Breaking the Silence. Note that your school administration may have guidelines or rules on what you are able to do to Break the Silence. Breaking the Silence assembly: Host a school-wide assembly for all the students and educators in your school. Securing a space in the school to host the assembly. Coordinating with a few people to speak at the assembly, such as a GSA president, students who coordinated the Day of Silence events, a local LGBTQ activist, and/or a local LGBTQ public official. Finding a video from GLSEN’s YouTube to play. Making sure you end the assembly by talking about action steps that attendees can take to make your school a safer space for LGBTQ students! Breaking the Silence rally: Have participants gather for a dynamic, action-focused rally. Determine your purpose and what you are asking people to do before your event; consider what you want changed in your school such as a GSA or student club, more supportive educators, more LGBTQ representation in curriculum, and/or school policies that specifically protect LGBTQ students. Secure a large public space, indoors or outdoors. Coordinate a few people to speak to attendees, such as GSA members who want to speak about ways they feel silenced and what they need to feel seen and heard, students who have had particularly meaningful Day of Silence experiences, a local LGBTQ activist, and/or a local LGBTQ or allied public official. End the rally with a call to action for attendees, the action that you want everyone to do. Breaking the Silence open mic: Create a space for participants to perform and connect. Schedule a few people who will perform, like student musicians, poets, dancers, or other performers. Secure a semi-private space and create a stage, designate a stage area, or simply create a semi-circle. Sound equipment preferred but not required. At the entrance to the event put out a sign-up sheet for attendees to perform. Assign someone as the MC (master of ceremonies) for the event. They will be the one to keep track of who is performing, introducing the next person on the list, and thanking someone for their performance. Keep the sign-up sheet near the entrance so that folks can continue to sign-up throughout the performances if they feel inspired. Allow folks to share performances about their identities, their Day of Silence experiences, experiences in school, and especially how they’re Breaking the Silence. Breaking the Silence teach-in: Educate your peers or teachers on what is needed to build safer schools for LGBTQ students. Explore GLSEN’s GSA activities and use one or more to teach others on how to build a more inclusive school environment for LGBTQ students. Challenge people to think about systems of oppression and how they impact building a safer environment for LGBTQ students. Be sure to have time for discussion and questions at the end of the activity. Breaking the Silence administrator meeting: Deliver a message to decision makers at your school, such as principals, directors, deans, or other administrators, asking them to make school a safer space for LGBTQ students and educators. Use GLSEN’s Breaking the Silence Letter Generator to draft a letter to your school’s administration with concrete actions they can take to make your school safer for LGBTQ students. As an added option, you can turn this letter into a petition and see how many people in the school community you can get to sign it. When you’re ready, schedule a meeting with a school administrator to deliver the letter, either by yourself or with your peers. Check out GLSEN’s Guide to Meeting with Decision Makers for more tips. Create a space for reflection and support for LGBTQ students who don’t feel safe enough to take other types of action. Secure a private space and create a calm environment where participants can feel comfortable unwinding. Ask a supportive school counselor or social worker to join you. A debrief group is more intimate and allows LGBTQ participants to share experiences they may have had during the Day of Silence that they would not feel comfortable talking about in public. There are MANY ways to Break the Silence. There is no right or wrong way to build your event as long as you center the needs of LGBTQ students. This work can be the launching point for the work that your school develops year around.